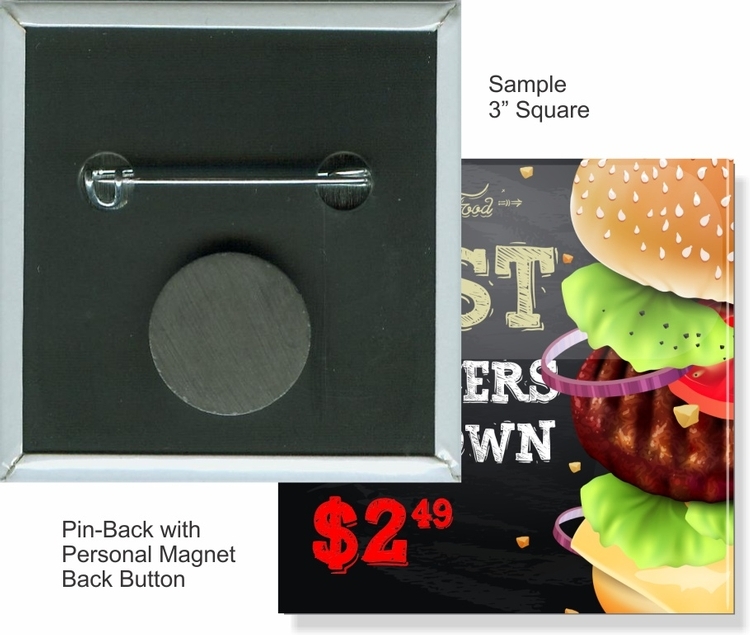 Square 3" button with a bar double magnet. 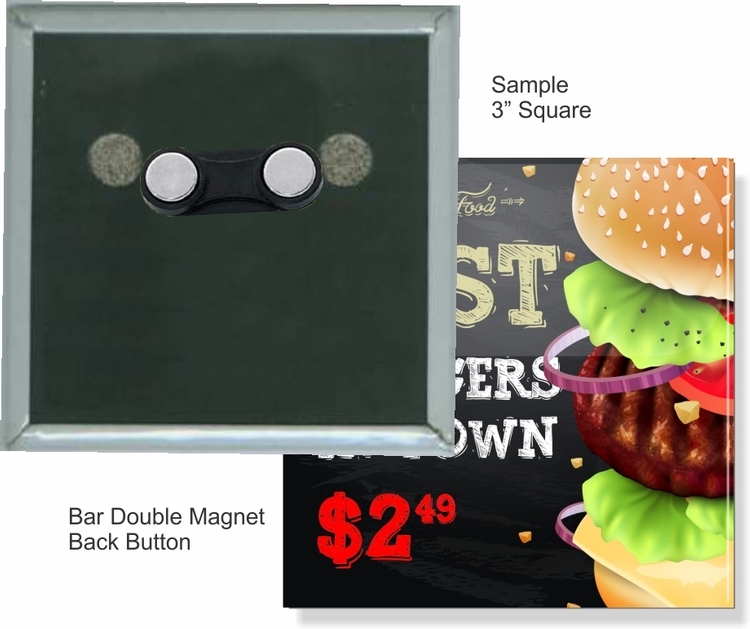 Custom full color 3 inch square button with a metal front, hard plastic back and a bar double magnet. Use any image. Any quantity, unlimited colors, free artwork, free setup and fast turnaround. No fees. Your only other cost is shipping. Free packaging in bags of 25 buttons. Square 3" button with a neo magnet. 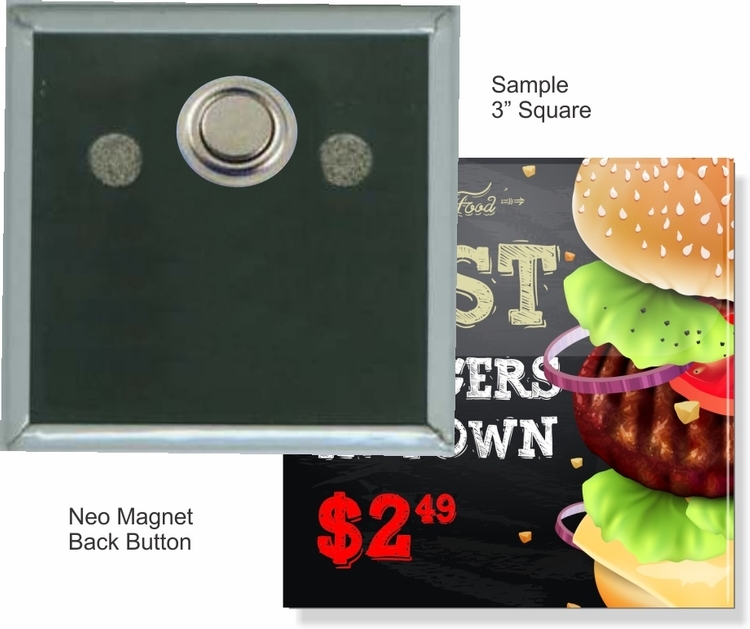 Custom full color 3 inch square button with a metal front, hard plastic back and a neo magnet. Use any image. Any quantity, unlimited colors, free artwork, free setup and fast turnaround. No fees. Your only other cost is shipping. Free packaging in bags of 25 buttons. 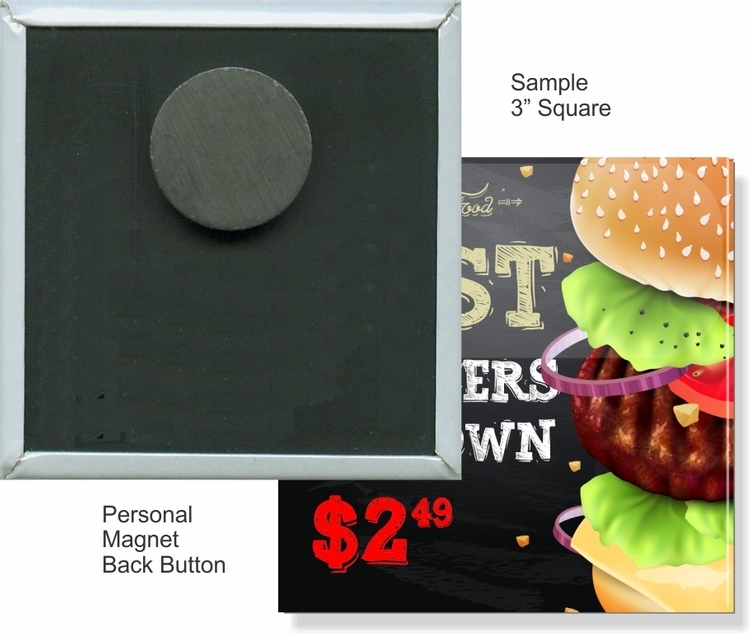 Square 3" button with a personal magnet. 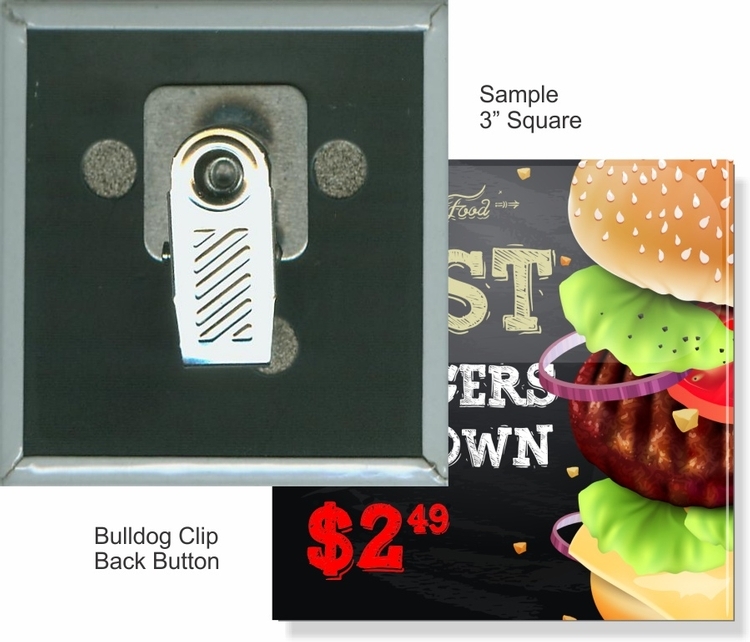 Custom full color 3 inch square button with a metal front, hard plastic back and a personal magnet. Use any image. Any quantity, unlimited colors, free artwork, free setup and fast turnaround. No fees. Your only other cost is shipping. Free packaging in bags of 25 buttons. Square 3" pin-back button. Custom full color 3 inch square pin-back button with a metal front and hard plastic back. Use any image. Any quantity, unlimited colors, free artwork, free setup and fast turnaround. No fees. Your only other cost is shipping. Free packaging in bags of 25 buttons. 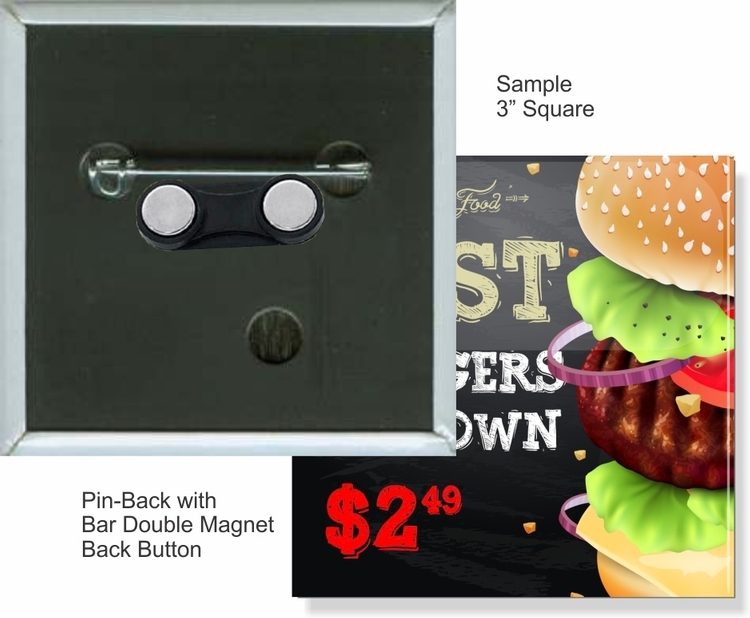 Square 3" pin-back button with a bar double magnet. 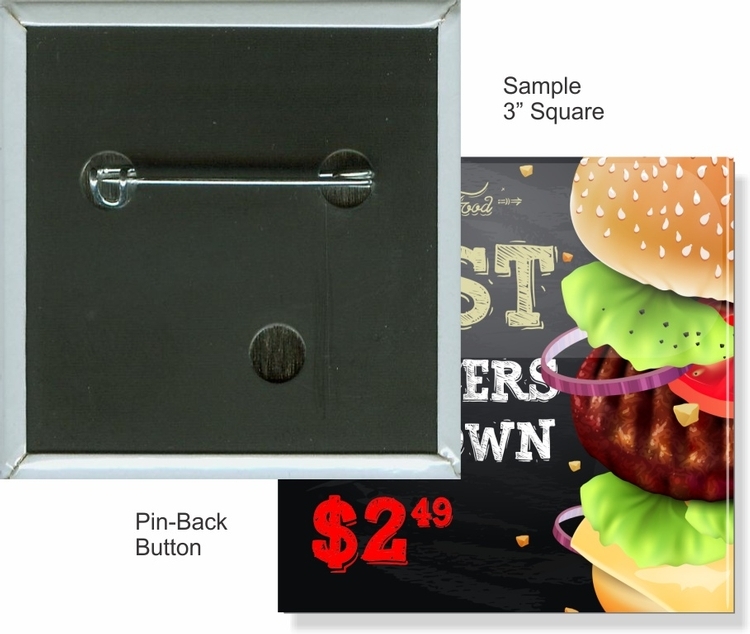 Custom full color 3 inch square pin-back button with a metal front, hard plastic back and a bar double magnet. Use any image. Any quantity, unlimited colors, free artwork, free setup and fast turnaround. No fees. Your only other cost is shipping. Free packaging in bags of 25 buttons. 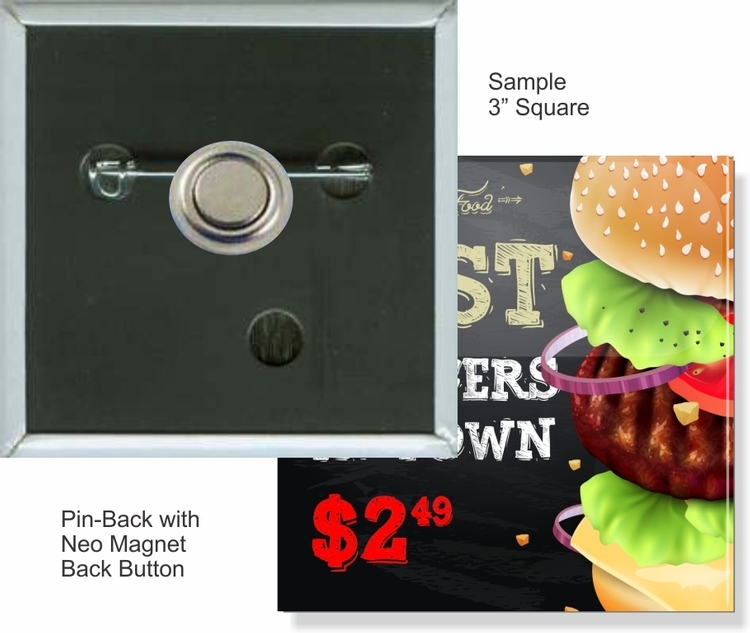 Square 3" pin-back button with a neo magnet. Custom full color 3 inch square pin-back button with a metal front, hard plastic back and a neo magnet. Use any image. Any quantity, unlimited colors, free artwork, free setup and fast turnaround. No fees. Your only other cost is shipping. Free packaging in bags of 25 buttons. 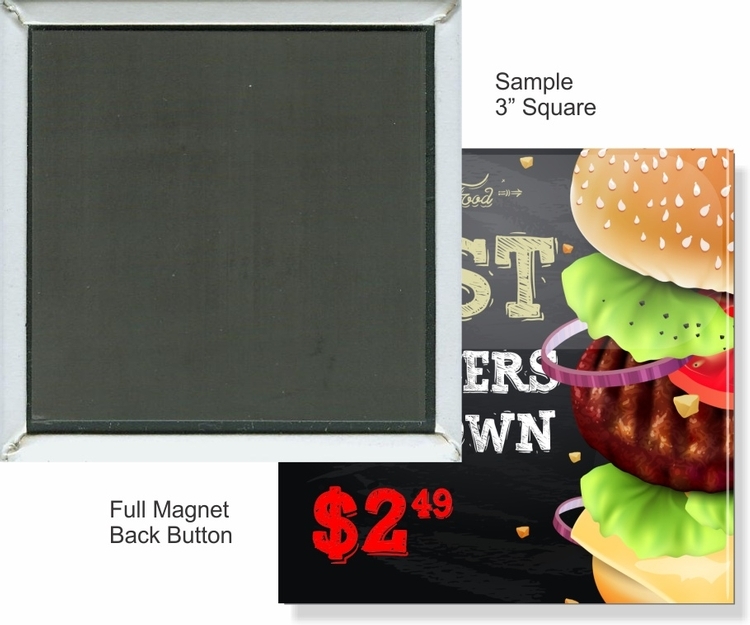 Square 3" pin-back button with a personal magnet. Custom full color 3 inch square pinback button with a metal front, hard plastic back and a personal magnet. Use any image. Any quantity, unlimited colors, free artwork, free setup and fast turnaround. No fees. Your only other cost is shipping. Free packaging in bags of 25 buttons.